What are all those flags? 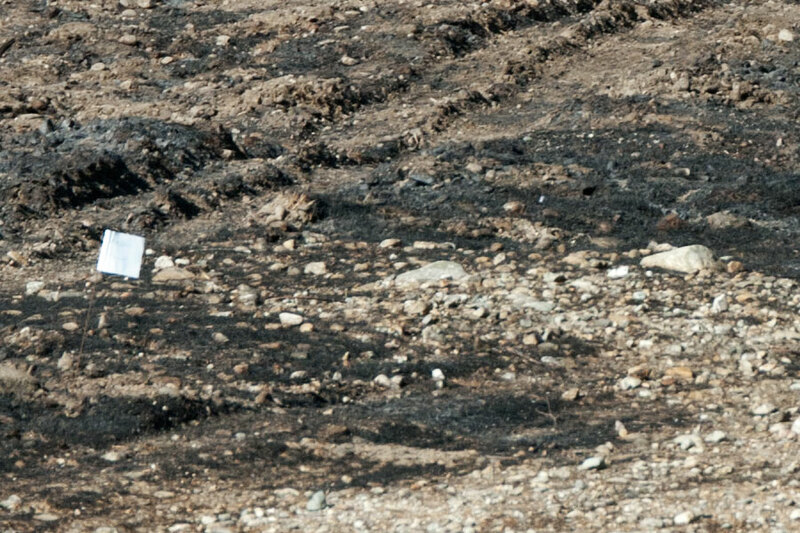 Flags marking Prof. Diane Thomson’s study plots in the burned area just west of the entry drive. ©Nancy Hamlett. Be assured that the flags are not a result of surveying or building plans; rather, they indicate that scientific research is already starting in the burn area! The orange flags visible from Foothill Blvd and Mills Ave all belong to Prof. Diane Thomson, Keck Science Center, who set up the plots in grassy areas of the field station several years ago to carry out experiments on coastal sage scrub restoration. Students in the Thomson research group used the plots to test the relative importance of seed limitation, competition, disturbance, and other factors on the ability of native annuals to recolonize areas that are dominated by non-native grasses. The initial experiments in the plots have been completed, but the plots have been maintained in order to observe long-term effects – and now they can be used to observe the effects of fire. 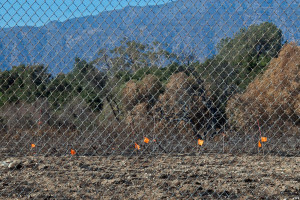 The Foothill Fire, however, destroyed or damaged many of the bamboo stakes that originally marked the plots. Metal tags at the plot corners, however, were spared, and Dr. Thomson quickly remarked the plots with orange flags before the metal tags could be disturbed. We will be looking forward to seeing what interesting things happen in those plots! You may also notice a few white flags around the edge of the burned area. White flag at the edge of the burned area marking a position for photographic documentation. ©Nancy Hamlett. These flags are marking stations that will be used for photographic documentation of the burn recovery. For at least the next two years photographs will be taken once a month from 10 vantage points around the edge of the burn area. The photographs will be made available to all for use in research and teaching. More projects are being planned for the burned area, so keep an eye out for even more flags!